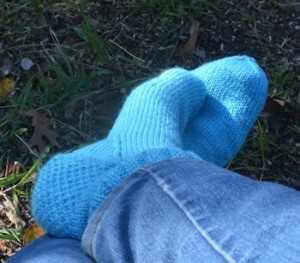 The latest pair is now on my feet: plain turquoise socks, the usual pattern, nothing fancy. This is not the best pair of socks I've made, but it's also far from the worst, and my feet have now been happy in it for hours, so it's a WIN. I'll be pushing on socks again this coming year. Another seven pairs of the shorties, and if possible another seven of the regular socks. I need to get to the point where all the socks have enough lifespan that I can do fewer pairs/year (and thus have time to play with knee socks, fancy colorwork, cables, etc. It is kind of like that, yes. It's called "Eye of Partridge" in some books, and "Reinforced Netting" in one book I have. That means doing the slip-stitch pattern on every other row, and then knitting (not purling) every other row, while keeping track of which rows are decrease rows and which are not for gusset decreases. What fits my feet best is a 2-decrease rows, 1-nondecrease row pattern. Which is like playing a 2/4 tune with one hand on the piano, and a 3/4 tune with the other and not getting mixed up.